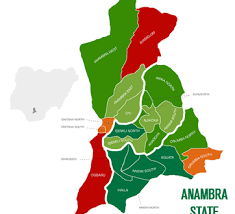 The Independent National Electoral Commission (INEC) on Thursday 29th March, issued certificate of return to the 30 elected members of the 9th Assemble of Anambra State at its headquarters in Awka the state capital. 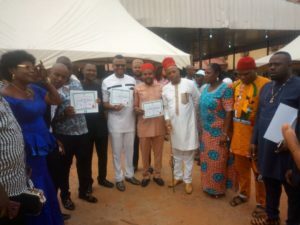 The Residence Electoral Commissioner (REC) Anambra State, Ukwachukwu Orji, while addressing the elected lawmakers, congratulated them on their victory at the 9th March 2019, state assembly elections and charged them to live up to their campaign promises. Orji, further added that the certificate of return is an evidence that they won the election at their different constituencies. Some of the elected legislators in their separate interviews reassured their constituents that the trust and confidence entrusted on them will not be betrayed. 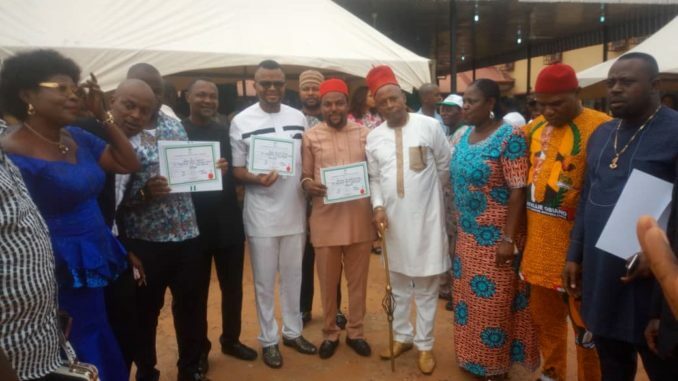 Member elect for Awka South 2 constituency, Chukwuma Pius Okoye told journalists after receiving his certificate of return that, “it is a great feeling and a dream come true” for him. Okoye, who was elected under the All Progressive Grand Alliance (APGA) added that he would continue from where the present Deputy Speaker Harford Osseke stop. He pointed out that Osseke has been supportive from the campaign period. House of assemble member elect for Oyi Costituency Charles Obimma on his part said his representation will be different because, “it will be based on accountability and transparency”. Obimma who won under APGA assured youths of his constituents that an enabling environment would be created for them so as to reduce their dependence on government. Orumba North Constituecy member elect Emeka Aforka explained to reporters that with the experience he has gathered when he served at the executive arm of government in the past, he will sponsor and enact laws that will improve the living standard of Ndi-Awka north and Anamberians at large. Aforka, added that he would make sure that all dividend of democracy due to his people would reach them, while emphasizing that he is not going to the 9th assembly to represent himself, but those who gave him the mandate. Anaocha 2 constituency member elect, Ejike Alloy Okechukwu, and Awka north member elect, John Nwokoye among others also pledge to deliver their campaign promises. The 9th Assembly would be inaugurated in June.